A concert by artists who participated in the award-winning film Microphone entitled ‘Microphone for Alexandria’ was held on 10 January 2011. The concert was part of the efforts from artists all over Egypt to reflect the solidarity between Muslims and Christians, after the Alexandria bombing that killed 21 people and injured 80 others. 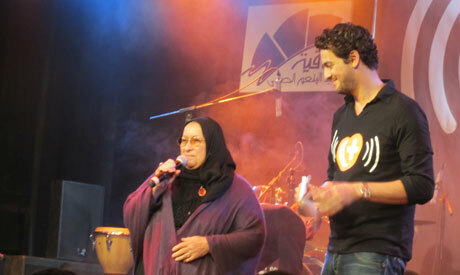 There was a reasonable turn-out in the River Hall at Al Sawy Culturewheel where the concert took place. The concert consisted of performances from Massar Egbari, Y-Crew, Soat Fel Zahma, Puzzle, Shady El Garf, Ana Masry and Wust El Balad. Hani Adel and Ali Helbawy were guest singers with Massar Egbari. Several artists prepared a few sentences about the events that took place in Alexandria, many criticising government complacency and people’s inactivity in facing up to discrimination. Artists included Ola Roushdy, Yosra El Lozy, Hana Sheeha, Basma, Ahmad Abdallah and Yousri Nasrallah. Two unexpected events took place on stage between performances. The first was a message sent by email by Nobel Peace prize winner Dr Mohamed ElBaradei and read out loud. The second was the appearance of Khaled Said’s mother, ‘Mama Layla’, who said she was there to support people as they have supported her when two policemen caused the death of her son in 2010. In her speech, she gave her condolences to the families of the victims of terrorism and police torture. The event was concluded with the crowd singing the national anthem, a capella.